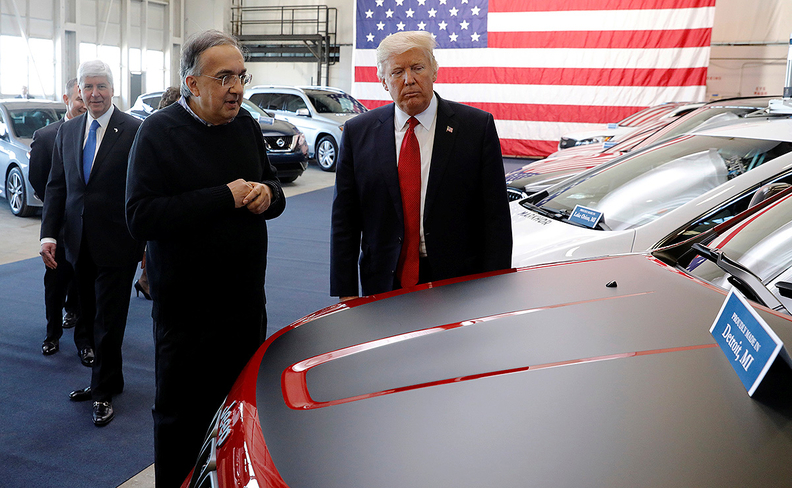 Marchionne shows President Trump a Jeep on Wednesday afternoon. DETROIT -- Fiat Chrysler Automobiles CEO Sergio Marchionne said he has "zero interest" in pursuing a merger with Volkswagen Group, despite bringing up the possibility earlier this month. "I only said that if you were the No. 1 automaker in Europe and somebody combines with another automaker to become the second and gets very close to your position, you're very first reaction is to distance the second again," Marchionne told reporters Wednesday. "We are the only natural combination partner for somebody who wants to do that. If you were playing a chess board game, that's what you would do," he said. Marchionne said he would be open to listening to offers from VW CEO Matthias Mueller. "If he wants to come, he knows where I live," he said. "I didn't chase him and I have no intention of chasing him. But if I'm right on consolidation and the fact you need to build scale, we're the natural place to go for him." Marchionne was reacting to comments made by Mueller in Germany about FCA merger speculation on Tuesday. "There is no contact at this time between me and [FCA CEO Sergio] Marchionne," Mueller said during a press conference in Wolfsburg. "I am not ruling out a conversation," Mueller was quoted as saying. Marchionne has long advocated consolidation among automakers to share the costs of making cleaner and more technologically advanced vehicles and has repeatedly relayed his desire via the media. "It would be very helpful if Mr. Marchionne were to communicate his considerations to me too and not just to you," Mueller said Tuesday, speaking in German.